With a highly Trained and Accredited Workforce and over 25 years experience in the scaffolding industry, Apex Scaffolding offer the highest standards of health and safety. Building contractors have a legal obligation to provide a safe working environment, making edge protection in the form of perimeter hand-railing a must for the majority of projects. A toe board, main guard rail and an intermediate rail help to protect against falls, as well as helping to minimise the risk of construction materials falling from the scaffold. Combined with fall arrest netting, roof edge protection provides the perfect solution for a safe environment when working at heights, for example in the construction or refurbishment of steel frame buildings. 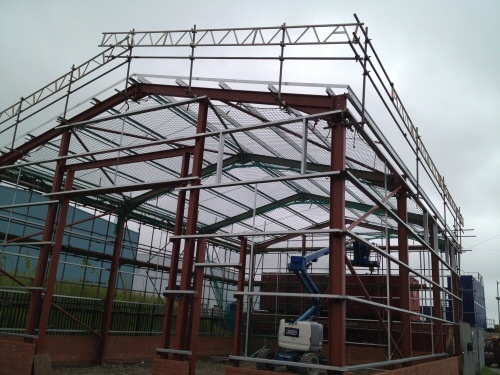 For any project, big or small, Apex Scaffolding will assess your needs and advise accordingly. To enquire about our edge protection, please email or give us a call.